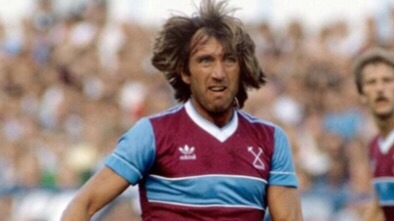 There are a lot of names put forward whenever the subjects of England’s most notable uncapped players comes up, but one you can guarantee will be mentioned is Billy Bonds. The man who turned 70 last week played 758 Football League matches in a 24-year professional career with Charlton Athletic and, mostly, West Ham United. While giving extraordinarily long service to the latter he captained them to two FA Cup triumphs and he was called up to the England squad. But Bonds would just fall short, never pulling on an England shirt after under-23s level. Bonds had a fairly fearless reputation on the field but off it he was seen as a quiet man. His friend Trevor Brooking, who played alongside him at West Ham for many years, believes this probably helped cost Bonds his England chance. “Had he pushed himself to the forefront more I believe he would have played for England. 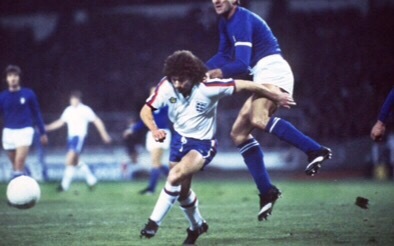 He’s one of the best players of my generation never to have won an England cap,” wrote Brooking in his autobiography. Harry Redknapp, who played and worked with Bonds at West Ham before the pair fell out when he replaced him as manager in 1994, also hailed Bonds’ playing ability. 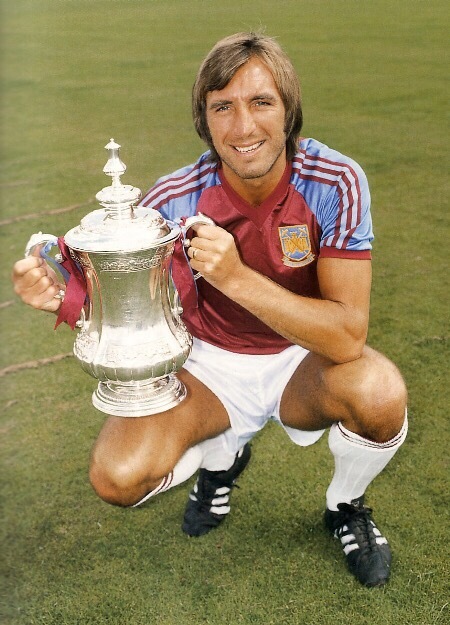 “Billy Bonds was the most fantastic player,” he wrote in his autobiography. “What would West Ham United, or any other club for that matter, give to have him now? He could play central midfield, centre-back, full-back; he was fearless in the tackle, he could run all day.” As we will see though, not everyone thought quite so highly of Bonds. Bonds would twice look set to be capped, only for the dream to cruelly be dashed. He had played for England twice at under-23 level, but he was 31 when his first real chink of light emerged. His old West Ham boss Ron Greenwood was appointed caretaker manager in 1977 and in November Bonds was called into the full squad for the final World Cup qualifier at home to Italy. All looked to be going well for Bonds, who had missed much of the season through injury but was now back in action. The call-up for Bonds was not met with universal approval, Norman Fox in The Times rather dismissively describing him as “a player who probably has many equals who would not be considered”. But Greenwood was keen to play down any suggestions he was handing out favours to a player who had served him well previously, insisting Bonds had been picked after recommendations from others. The fact he was versatile and could operate in midfield or defence helped Bonds’ cause. Bonds was left watching on as England beat Italy. And then came a club match against West Bromwich Albion just four days before the Italy clash. Greenwood would unfortunately see Bonds find the going tough in a 3-3 draw. David Miller wrote in the Daily Express: “The message to Ron Greenwood as he sat watching a 3-3 draw at Upton Park was crystal clear: his call to Billy Bonds comes several years too late for the rugged warhorse.” On the eve of the game the team was announced, with Bonds only on the bench. Greenwood insisted Bonds had only been selected for the squad as defensive cover, with his first-choice selections given the green light to play. Bonds watched on as England beat Italy 2-0, a result that proved uplifting but insufficient for the team to reach the World Cup finals. Greenwood was given the job permanently but Bonds would stay uncapped as he moved towards his mid-30s. West Ham’s relegation in 1978 did not help his cause either. But then came the 1980-81 season, an Indian summer for Bonds. A year on from lifting the FA Cup for the second time, Bonds captained West Ham to the League Cup final against Liverpool, played in Europe and helped his side to a dominant Second Division title. And in May 1981 another call came from Greenwood. England had a decimated squad for the friendly against Brazil and the Home Internationals that would follow, with their defensive options particularly limited. Greenwood looked towards his former club, believing Bonds and promising youngster Alvin Martin could fill the void. Just a few months short of his 35th birthday, Bonds was in line to become one of England’s oldest debutants. “I thought my chance had passed by years ago,” admitted Bonds, who added that he would be particularly pleased for his father if he was capped at last. It was reported Charlton stood to scoop a belated £2,500 bonus if Bonds played, owing to a clause in the deal when he left them in 1967. All that was left was one end-of-season match for West Ham on a Friday night at Sheffield Wednesday, with the title already long wrapped up. Just 90 more minutes of club football to get through and then he could at last represent his country at full level. West Ham won, but Bonds injured his ribs after a clash with goalkeeper Phil Parkes. He played on and was adamant that he, along with Martin who had also picked up a knock, would be fit for the Brazil match. “I’m 99% sure we will be ok for the internationals. But we will know for sure in the morning,” Bonds said, having helped his side finish 13 points clear at the top (a huge amount under two points for a win). Was he trying to put a brave face on it or did his injury seem less severe than the reality? Because Bonds would duly be ruled out of representing his country, as Martin (the only recognised central defender in the side) duly made his debut during a 1-0 defeat to Brazil. For Bonds there was a feeling his last realistic chance had passed. And so it proved. No caps would come his way. But Bonds continued to serve West Ham well, playing for them beyond his 40th birthday in the top-flight until he finally called it a day in 1988 (later becoming manager). That year also saw him appointed an MBE and collect the PFA Merit Award in recognition of his contribution to the sport. Bonds may not have won any full England caps, but he had enjoyed a career to be proud of.